I love designing salads. As paints are for an artist, the colors of lettuces and greens, carrots and beets, scallions and persimmons, olives and peppers, corn and peas, tomatoes and cucumbers, apples and oranges, strawberries, nuts, dates, raisins, and cranberries are my palette. 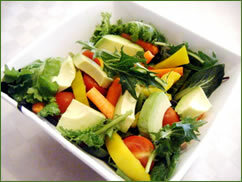 I think about how their tastes and textures, as well as colors, create a beautiful, delicious, and healthful balance. But the salad is never complete until I have decided upon the perfect combination of vinegars and olive oils, enhanced with garlic, herbs, salt and pepper, to impart a glow to the greens. As a painting may fall short of the painter’s intentions, my salads do not always succeed in achieving the qualities I hoped for. But the designing of a salad is still a creative act for me. I lose myself in the possibilities of combinations and how each vegetable or fruit might enhance the flavor or beauty of the others and complement the main course. My mind is so engaged in the creation of my salads, I am not aware of the passing of time, as my husband has reminded me as sits at the table waiting for me to finish. I was struck by how this description of creative activity also describes meditation. Patanjali, in the Yoga Sutra, explains the levels of connection between ourselves and the object of our focus, culminating in deep contemplation or samadhi. First, the senses leave their usual focus on the activities around us; this state is called pratyahara. By eliminating distractions, we can enter a state of concentration, known as dharana, as we focus on an object. As concentration becomes steady and prolonged, a deeper state or meditation, known as dhyana, may evolve in which an interplay exists between what we are focusing on and ourselves. Returning to my example, the salad is the object. My pratyahara is the honing in on making the salad. My senses are engulfed completely by the colors, textures, smells, and tastes of my ingredients, which elicits a state of concentration or dharana. Dhyana is not only linked with what I have created physically and aesthetically, but also with the nourishment, healing and quality of health that is derived by eating it. It is almost as if the salad communicates with me, making the link more intense. The deepest level of focus is contemplation, samadhi, in which we lose all sense of ourselves so only that object of our focus remains in our mind. Frequently I have found many people thinking that meditation requires being seated on the floor in a lotus posture, eyes closed, sitting perfectly still and emptying the mind. Yet, you can see that while meditation requires clearing the mind of distractions, what it really requires is coming to such focus that we have a deep connection, a link, almost an integration with whatever is our chosen point of focus. What a wonderful explanation of meditation! Thank you for your insight and thoughts. The only thing better would be a sharing of recipes for those delicious salads. Have a great day.